Polenta??? You mean that tasteless corn meal mixture that comes in a tube? Absolutely not! Choke yourself! I recently saw that tube at my local trader joes. I tried it. It figuratively tastes like nothing. The thing I did find out, is that it makes an excellent flavor vessel. It will absorb whatever sauce you throw on it, and it makes an excellent addition to any meal as long as theres a sauce. I decided it didn’t have to be just a vessel. It could be a vessel, with a tiny party inside of it. It was time to make homemade polenta. I took 5 minutes to emotionally prepare myself for this to be a difficult task. When I read up on it, I was pleasantly surprised. It really just involves stirring and boiling. The cornmeal did throw me for a brief loop though, I began gingerly pouring it into my boiling water, and whisking. The cornmeal immediately began to clump. It clumped into these ridiculously hard to break up mal-shaped little cornmeal turds. I went with my gut reaction, and grabbed my hand blender and went to town. If you do not have a hand blender, heed this warning. Pour very slowly. The clumps are very annoying. Beurre blanc is my favorite butter sauce, it takes on flavors easily as well. If you choose to make it with another meal, take the herb that you are using for your main course and toss a few bits of it in place of the thyme. It will suddenly perfectly compliment your meal. There are way too many plain beurre blanc recipes out there. I spent a long time trying to determine what would make all this come together. I know this sounds ridiculous and simple but just placing all of this over a bed of fresh arugula was the perfect end to this meal. It added a peppery softness that contrasted the heaviness of the sauce and the polenta very well. Its not just a pretty garnish anymore. Roast your red pepper, along with your bulb of garlic for approximately 30 minutes at 350. (I put my garlic in tinfoil and pour approximately a teaspoon of olive oil over it) Once your water is boiling, SLOWLY begin to pour in your corn meal, whisking it as it goes in. Once you have poured in all of the cornmeal, drop your heat to medium low, add salt and continue whisking/stirring until your polenta begins to thicken. Throw in the bell pepper, shallots, garlic cloves, and about half the cheese. Stir continuously for 5 minutes to let the cornmeal absorb the water. Generously ladle the polenta into a greased muffin tin. This made about 12 full sized polenta cakes. Sprinkle the top with the remaining parmesan, and bake for 10 minutes at 400. Take the polenta out of the oven and let it cool for a few minutes.. Melt the butter and add in the wine and lemon juice. Bring that to a boil, and the salt and pepper, and shrimp. Cook the shrimp on each side until they have completely changed colors, and the tail curls into itself tightly. About 5 to 7 minutes. 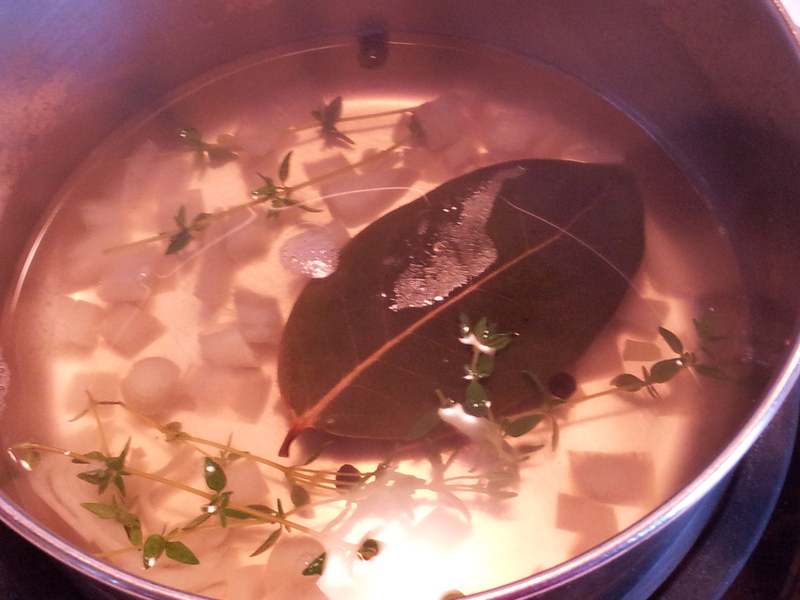 Add your wine, lemon juice, salt, garlic, shallots, peppercorn, bay leaf and thyme into a small sauce pan and bring it to a boil. Reduce it down to about 2 tablespoons, and strain the liquid into another small pan. Drop the heat to medium low and drop in your butter. Slowly whisk your butter into the flavored wine. I found it easier to cube my butter and move the pan around on the burner while it melted. That was also the only time my beurre blanc thickened to the level I wanted it to without extra magic. (probably because of the wishful sauce dance I did right before making it. I call it magic. Not skill.) I had my butter slowly melting into my wine. I began to drizzle in the heavy cream. Just keep whisking and drizzling for about 3-5 minutes. 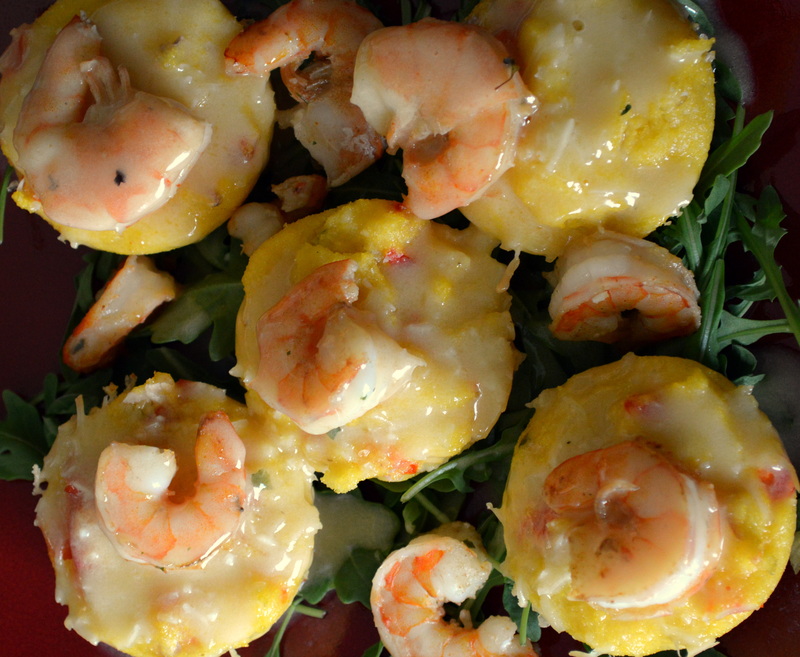 Once your beurre blanc has thickened, cease your sauce dance, and pour it over your polenta cakes and shrimp. Don’t let it sit, don’t clean, just get it on the food and out to the table and get to eating. Now here’s a quick trick that may just send me to culinary hell. If your sauce doesn’t thicken, sometimes it just decides that you are a bad person and won’t, just take a pinch or two of flour, and throw it in there, turn your heat up and stir while it works its magic. A PINCH. Not a tea spoon, not a table spoon, A PINCH. Otherwise people will taste it, and look at you with disgust. For shame. 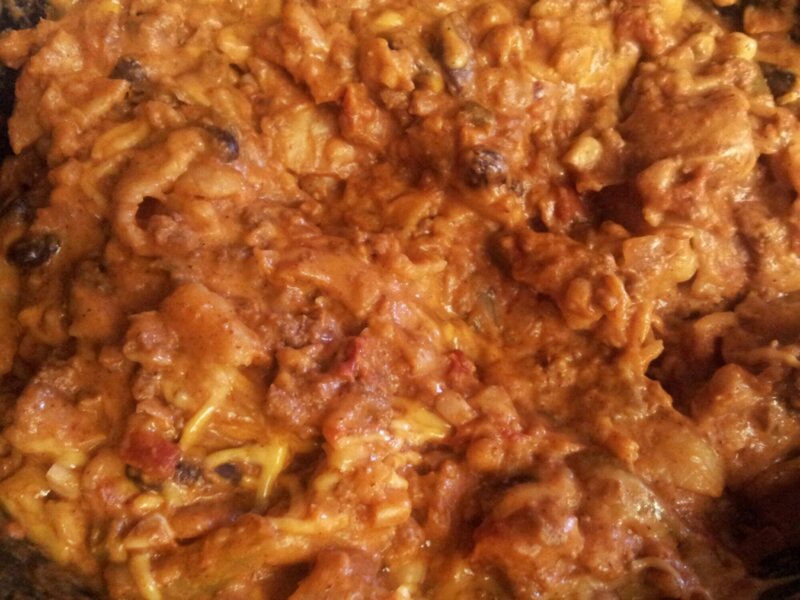 MRE Chili mac… I’m a bad person and I should feel bad. 1 cup of noodles, shape of your choice. Alright, so maybe it’s not quite the same, but who actually wants that exact flavor. It’s close, only fresher with a touch of zest. I use my crock pot and put it on high, but when I didn’t have one, I just left it on the stove on low all day. Brown your beef and drain the fat. Drop that in your crock pot, and throw in your tomato paste, tomato sauce, crushed tomatoes, peppers, onions, beans, herbs and spices. Let that sit for 4 to 6 hours. Add your noodles in, and let it sit for one more hour. Mix in your cheddar and cream cheese giving the cheese enough time to melt. 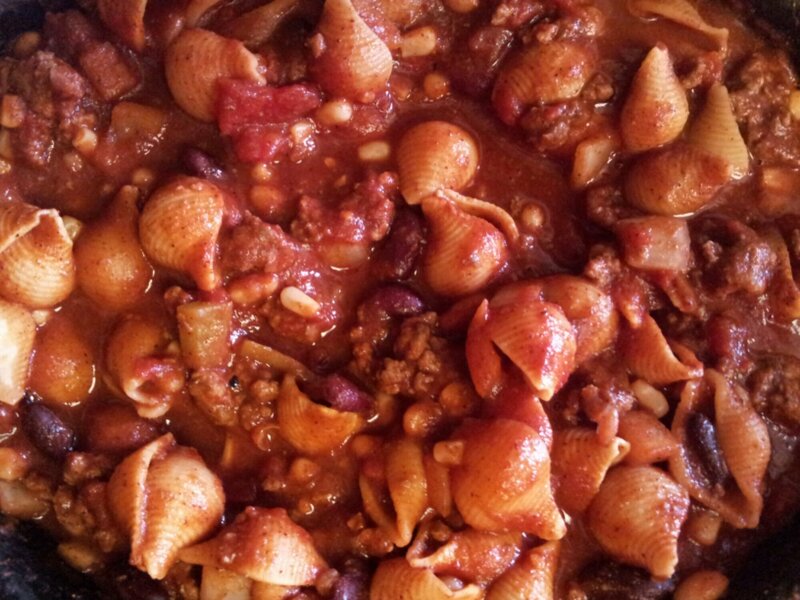 Serve it with your favorite chili fixins’ and chow down. What is cave aged you ask? It’s not actual cheese that is aged in a cave(it should though. I want a cave full of aged cheese), but cheese that is aged in specific cave like conditions. For example, humid, chilly , but not so chilly that it doesn’t age. It is then left there for over 3 months. What you get, is a cheese that is moist, but not gooey, flavorful, and smells like a hobos armpit. Don’t smell it. Just eat it. Some things you should just stick in your mouth and not investigate. Back in the day, the vikings used to use onions as a way to test entry wounds to the stomach. They would feed them to the wounded, and if they smelled like onions after, they were doomed to die. This soup could surely have been used for such a test, as a recipe for 2 contains no less than 4 onions. half of which a cooked down into an amazing sludge that will end up in your beef stock. Not only is that sludge amazing in your stock, I found that spreading it all over slices of gruyere toasted baguettes made moan in food ecstasy. While your garlic is cooking begin to saute half of your onions with butter, sugar, and salt on medium high until they are blanched, and begin to brown. Drop the heat down to medium low and let them simmer for about 10 minutes. Add half a cup of water, and continue to cook them down. I repeated this process 5 more times, each time allowing the water to almost cook off almost completely until it had the consistency of a gravy. One you have reached that point, add in the roasted garlic. When you’re done it should look like this..
Lightly drizzle Olive oil over your slices of baguette, and sprinkle a scant amount of gruyere over the top. Place them in the oven at 350 for 20 minutes, or until they are beginning to brown and are crispy. While they are toasting, take the rest of your onions and saute them with a bit of salt and the thyme and oregano until they are blanched. Add in 4 cups of beef broth, and your onion and garlic mixture. Let that simmer while your baguettes cook. Place your toasted baguette into your ramekins, and begin ladling your soup into the bowls to just shy of the brim. You want that baguette to float to the surface, so your cheese has something to rest on. 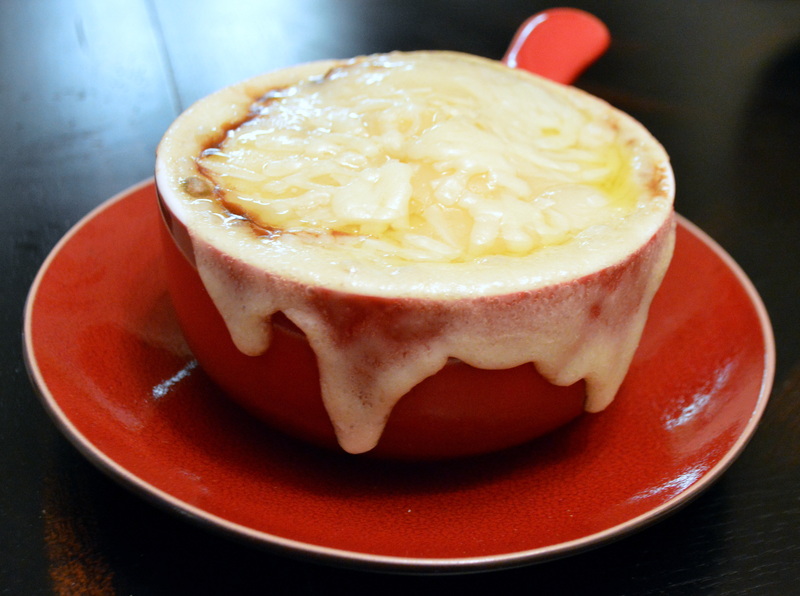 Evenly distribute your cheese over the top of your bowl and sprinkle the remainder of the gruyere over the top. Bake at 425 for 15 minutes. Set it out to cool for 10 minutes, and dig in. Over the last month or so people have been mentioning bacon wrapped dates to me. I’ve attempted to find them in the Seattle happy hour scene with no luck, so the next best thing was to make them my self. These little gems were super easy to make. 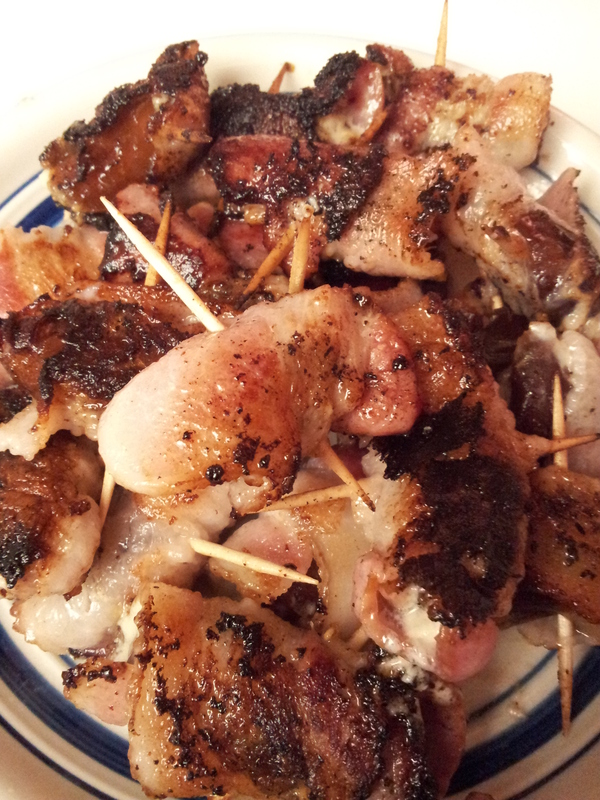 And the yogurt sauce provided a clean sweet and sour taste that brought out the flavor of both the date and the bacon. The only bad part about them is the repetitive motion injury you get from stuffing your gob with them. This little abomination to one of the East’s most wonderful fruits, will surely become one of the west’s favorite new treats. 2 tablespoons of high quality maple syrup. I had half a pack of pitted dates, and half a pack of non pitted dates when I started this little project. Dates with pits are far easier to work with and have more space for goat cheese. Following that advice, slice open and remove the pit from your dates. Place a small amount of goat cheese in each date, wrap each date with bacon only one layer thick, and secure them in place with a tooth pick. Next fry them over medium high heat for approximately 3 minutes each side and serve them with maple yogurt sauce. 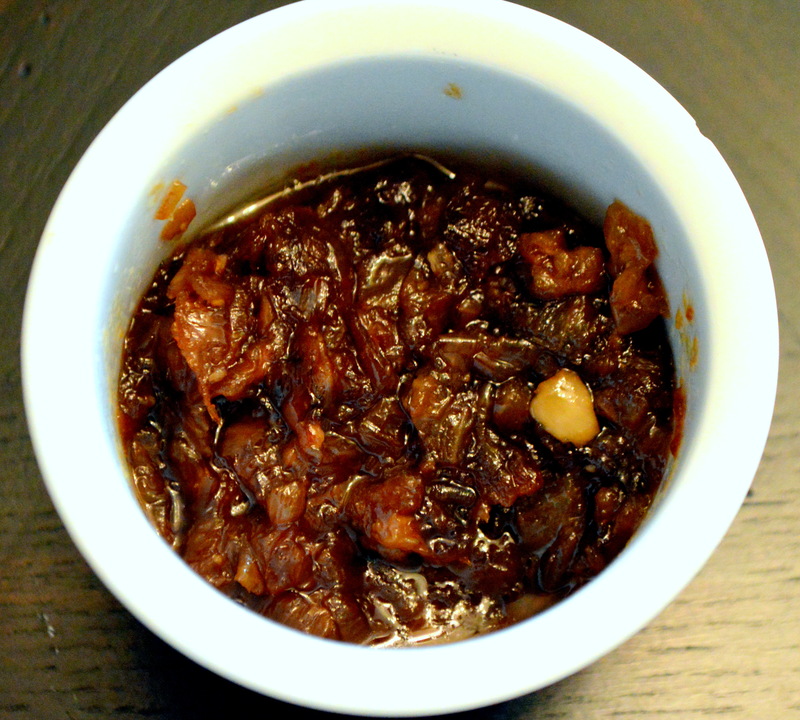 Mix together Greek yogurt, brown sugar, and maple syrup until its completely combined together and there are no lumps remaining, and begin liberally dipping your dates in them. 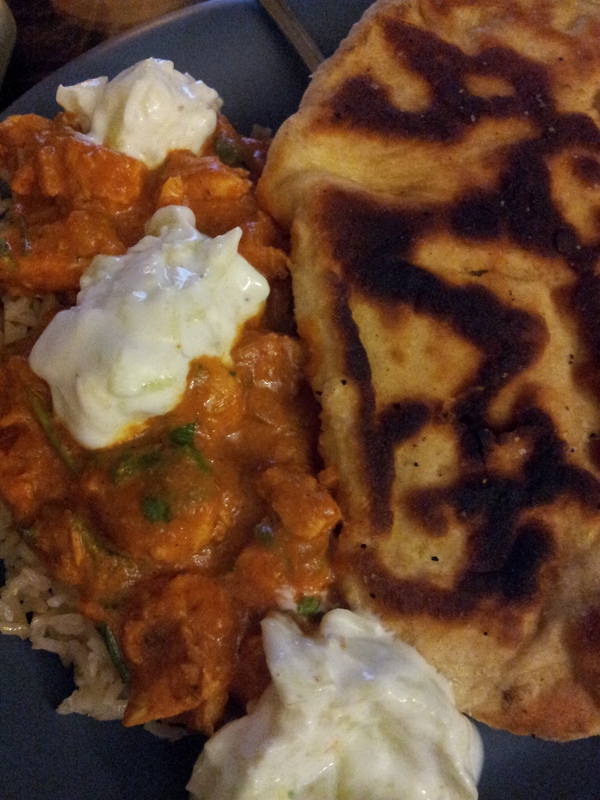 I could eat naan bread all damn day long. I love it, dipping it in different sauces, eating it plain, using both hands and happily stuffing my face. I’ve tried to make naan bread quite a few times unsuccessfully. Last week I finally nailed it. It’s light, fluffy, and bubbles up just right. Previous attempts have been dense and slightly bullet proof. The key to fixing this was rise time. I let this dough rise for 4 hours. This allowed those bigger pockets of air to begin to form and lighten it up a bit. This is true with most breads. If you’re looking for a dense bread, say a sandwich bread, half an hour to 1 hour will do. If you’re making something like a brioche roll, or french loaf you can do a couple of rises stretching over many hours or over the course of a day with varied results depending on rise time. I just happened to leave for 4 hours to shop for the rest of my dinner ingredients and that seemed absolutely perfect for my naan. In a small bowl add milk, sugar, and yeast and allow the yeast to activate. In a separate bowl combine your flour, salt, baking soda and baking powder. 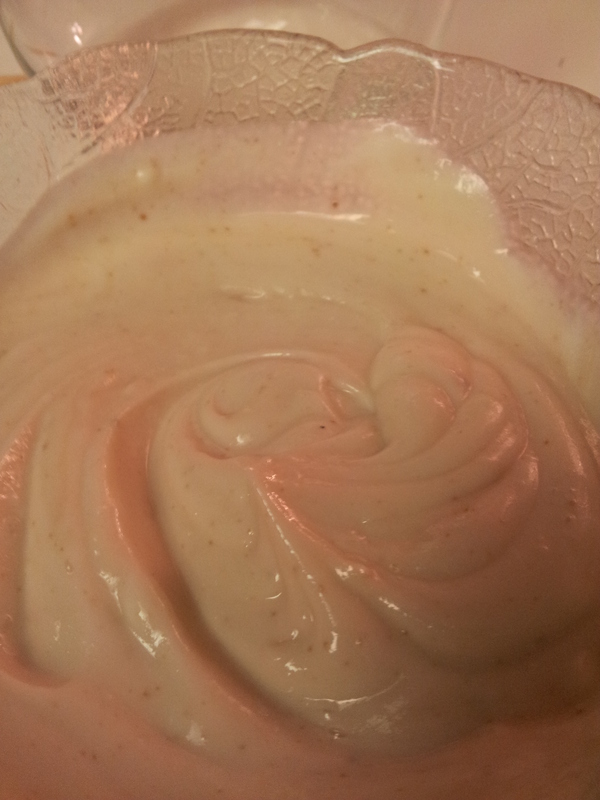 Once your yeast is ready add that and the Greek yogurt into the flour. I used a stand alone mixer with a paddle attachment, but it should be easy enough to mix and kneed together by hand. When the dough pulls away from the side of the bowl, remove it, and form it into a ball. Set that in a warm covered greased or oiled bowl for a few hours. Come back, punch down your dough once or twice and break it into 8 to 10 little balls. On a floured mat, roll each piece out to approximately 2 mm thick. You want it thin because it will puff up when you cook it. Much thicker than 2 mm and it will come out very thick. Heat up a cast iron skillet to the high side of medium high and brush each side of your naans with butter or olive oil (at this point I gingerly sprinkled both sides with a touch of garlic salt). Cook your naan on each side for 1 to 2 minutes until bubbles form on each side. Serve it warm with your delicious dinner.